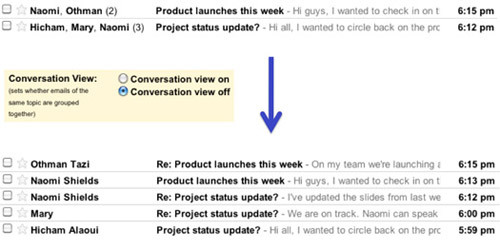 One of the reason why I prefer Gmail over any other email service is its conversation view. With conversation view, one can view whole of the email conversation within a single thread. Therefore the user need not to open the multiple emails. Since Gmail was launched they didn’t provide the option to turn this feature off. If you are one of those people who don’t like this feature then you can turn this feature off now. To turn it off, simple go to your Gmail settings page and look for Conversation View section. Now select the Conversation view off option. That’s it. You can read more about it at Gmail blog. We would love to know what do you think about this new feature. Do you like Conversation feature or dislike it ? Great information. This is a really excellent read for me. Must admit that you are one of the best blogger I ever saw. Thanks for posting this useful article.